← How to extract image from PDF and set extraction page range? Question:I have a PDF file with 3 concert tickets and I need to send only 1 to someone. How? I bought 3 concert tickets online and they were emailed to me in a PDF file. I sold one of them and need it email it to the purchaser. How do I send them only one of the tickets and not all of them? Answer: If the 3 concert tickets are kept in three pages, you can use VeryPDF PDF Split-Merge,which can help you split PDF into single pages. There are lots of articles in our knowledge base about this software, so you can find an answer easily. If the three tickets are kept in one page, you need to cut this PDF page into two or three parts then save it as a new PDF. By this way, you can email the single ticket PDF file to the purchaser. In the following part, I will show you how to make it. The software I will use is VeryPDF Advanced PDF Page Cut, by which you can break PDF pages into small pieces both in Windows or Mac OS X systems. Please check more information on its homepage. Now let us check how to use it. This is GUI version software, so when downloading finishes, there will be an exe file. You need to install this software by double clicking the exe till there is an short-cut icon showing up on the desktop. There are two versions of this software: Mac and Linux, please download the right version according to your computer system. Step 2. Split PDF of one page into three parts and save them as new PDF file. 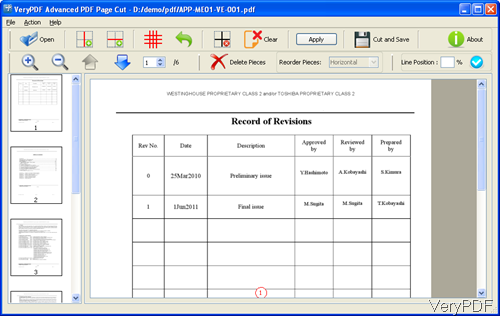 Please click button Open to add PDF file to software interface then add PDF file will be shown on the software interface. There are two red lines icon Draw vertical lines and Draw horizontal lines to manually draw cut marks, for separating areas where you need to separate them into small little parts. Say of if you click Draw horizontal lines, the input PDF will be cut into two parts. Then please click button Delete Pieces to the other two tickets. Then click button Cut and Save then you can save the only one ticket part as a new PDF file. When there are many pages and layout are same, please click button Apply All then you can cut all pages into two parts. There is also command line version available, if you need to cut pages in PDF by command line, you can make it by this one software. During the using, if you have any question, please contact us as soon as possible. Can I split a large PDF file every two pages? How to extract the useful part from PDF page? This entry was posted in PDF Page Cut and tagged split PDF. Bookmark the permalink.